If diagnosis is so good, why do so many people hate it? Diagnosis is at the core of what I do when I practice psychiatry. I’ve already blogged about how I use it, and I get good feedback from my patients (yes, I still use that term, as I don’t think of myself as a service to be used: I’m nothing like a mobile phone). So, today’s blog is setting down some of my impressions about why things seem to go wrong with diagnosis for so many. And, as it’s a blog, I’ll be making assertions without always quoting data, so please correct me in the comments section if you think I’m wrong, saying why. I currently do my clinical work in private practice. OK, my practice involves families and children, so assessments take longer than usual, but I typically take 3.5 hours across two appointments and some background work if an assessment is uncomplicated. That’s despite using an online interview schedule to cover the routine questions. What am I doing? Explaining to the patient what the assessment is going to cover, and why. Reading the results of the online assessment, and preparing my candidate list of diagnoses. Reviewing my candidate diagnoses with the patient. They’re usually correct, as the online assessment tool is reliable and valid, but I explain how they’ve been arrived at. Checking that the diagnoses made make sense to the patient: in particular, whether they still support what they’ve put into the online assessment. Undertake some standardised tests of cognitive function, and see if any of my diagnoses need reviewing in the light of those findings. There may be blood tests, brain scans (rarely) and the like too. Describe the scientific background to the diagnoses, and how they have been modified or clarified by any additional tests. Discuss the implications of the diagnoses for the patient’s life, and how their identification can improve it. This may include a discussion of appropriate and available treatments. Health service assessments are now often made by teams of people with different backgrounds and skills. The general rule followed is that the cheapest person (based on salary) with the skills does the part of the assessment that their skills can cover, and are then handed on to more skilled (and expensive) team members for additional assessment components if required. Diagnosticians (mostly doctors) are among the most expensive team members, and may make routine or obvious diagnoses from information provided by other team members, without seeing the patient themselves, which saves scarce medical time. Sometimes, the diagnosis may be so obvious a professional diagnostician may not be needed. Here, the nurse has defined two sets of signs and symptoms from the medical diagnosis, grouped them either as assessment targets, or as new “nursing diagnoses” and used these, rather than the medical diagnosis, to inform the actions the nurse will take. The nursing textbook I used offers a range of common nursing diagnoses occurring in DSM psychiatric disorders. For autism, it suggests as common nursing diagnoses “risk for self-mutilation”; “impaired social interaction”; “impaired verbal communication” and “impaired personal identity.” Doctors would only recognise the middle two as part of the autistic syndrome. Other differences in this book are more extreme: for example, the nurses’ diagnoses associated with Tourette’s syndrome do not mention tics, the cardinal feature of the medical diagnosis. While nursing diagnoses per se have not been widely adopted in the UK, the nursing process which underpins them has, but with nursing assessments leading directly to nursing actions. The same argument can be made, mutatis mutandis, with respect to the other professions making up a multi-disciplinary team. So, dependent on which professional the patient talks to, and in what order, there are likely to be a melange of possible explanations of what having a diagnosis means. These different explanations will be scattered across several appointments, possibly weeks apart. Each individual appointment will probably be too short to explore the patient’s understanding of what they’ve been told in any depth, even though, in total, they probably took up more time than I spend. 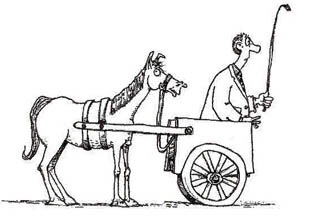 The end result can be patients who don’t understand what they’ve got, don’t think what they’ve been told fits their experience, or know why people think they’ve got it. Confusion, incomprehension and contradiction are not the only complaints made against diagnosis. An assertion, common to some service users (I’m happy with that term in this context) and anti-diagnosticians alike, is that diagnosis is a kind of sentence, allowing The System to make all sorts of arbitrary, unhelpful decisions about people’s lives, where appeals get lost in endless bureaucracy, and failure to agree is countered by mind-bending chemicals or deprivation of even more liberty. Even worse, many service users describe experiences where this is exactly what is happening. While anti-diagnosticians and I can argue the toss endlessly about whether this is inherent in diagnosis, my position means I must come up with another explanation of how this is happening, as it clearly does. Simply saying “bad practice” isn’t good enough: very few health professional go to work to make their patient’s lives worse, and those that do are rare enough to be international news, and go on to long prison sentences. Also, while these sorts of thing occur more frequently in poorly performing units, it is part of US inpatient culture, and similar patterns can be identified in even the best UK units. As both the presentations I’ve linked show, it doesn’t have to be that way. The presentations I’ve linked also give one explanation, the way these over-controlling behaviours by staff are backed by a framework of false stories, that prevent the discovery of alternatives. Pacifists incarcerated in mental hospitals in the Second World War were able to discover de-escalation techniques similar to modern recommendations very rapidly, while the usual staff were not. These stories aren’t coming from the patients’ diagnoses, but rather from the formulations we use to understand their behaviour. I’ve already blogged about the dark side of formulation, so I won’t repeat myself here, but medical science has a long and honourable history of removing the worst of these from psychiatric patients. However, there is another possible reason, which deserves its own section. but to understand why it’s important, and what the consequences can be, we need to be clear about how psychiatric diagnoses are constructed. As I explained before, diagnoses, including psychiatric diagnoses, don’t depend on understanding the cause of a problem to be useful. Their primary job is to predict a range of useful treatments, and indicate a likely outcome. Individual symptoms (what the patient complains of) or signs (what the diagnostician observes) are usually lousy at this. Yup, she’s worrying. But is depression? or anxiety? or hyperthyroidism? after all, she looks pretty worried too, unless you realise the reason for her “worried” expression is actually lid lag (drawn, but not mentioned in the labelling), and yes, worry is a symptom of hyperthyroidism. Diagnoses start to become reliable when we combine symptoms and signs together: these combinations are called “syndromes”. The image of hyperthyroidism just above is an example of a syndrome based on signs, though in reality these are also combined with symptoms and laboratory investigations to make the diagnosis: the key is to combine symptoms and signs that all relate to the condition they denote. Needless to say, this is no easy task, especially in mental health, where there is usually no way to directly measure whatever system is causing the problem. So, psychiatric diagnoses make it into the great classification manuals, currently ICD-10 and DSM 5, only after extensive review and testing, which never stops. They aren’t safe even after they arrive, as they may be modified or dropped as new research findings emerge. Because the science that validates them has, inevitably, a margin of uncertainty, subtle differences may also arise in how the different systems describe and encode the same condition. This is why a psychiatric diagnosis should always be qualified by the system and version it has been made under. However it has been arrived at, making a psychiatric diagnosis involves collecting signs and symptoms from the patient, and then seeing if there are enough, that have enough severity, to fit one or more diagnostic categories. So, the diagnostic profile arrived at is directly related to the patient’s presentation, and the categories have been extensively tested to be fit for purpose. So, while it’s safe to infer (a valid and reliable) diagnosis from symptoms, it’s not safe to infer symptoms from a diagnosis. We experience this in real life as the same diagnosis presenting differently in different people. More formally, it’s because a set of symptoms sufficient to make a diagnosis is only a subset of all the possible symptoms related to the diagnosis, so many different subsets are possible. In the diagram I’ve borrowed, causes are called “Predictors”, and their effects are “Outcomes”. It’s good practice to think this way, as all to often that’s the most we can say about a putative cause. Each arrow denotes a path of influence, hence the name “path diagram”. They’re arrows because, as we’ve just argued, the paths go in one direction only. Path “a” tracks the predictor to the outcome. Path “b” tracks the moderator. 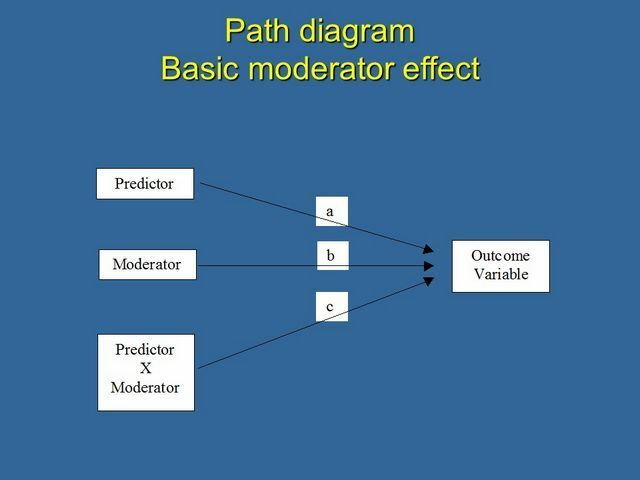 Path “c” tracks the interaction between the predictor and the moderator. Let’s create an example, to see how it works in practice. The extra step in path “c” describes the interaction. Conduct Disorder is a moderator because its influence is on how the soup is rejected; the cause of the rejection is clearly the hair. I’m now going to construct two interchanges between our patient and a nurse. In the first, the nurse focuses on the patient’s Conduct Disorder as causing the problem, in the second, s/he focuses on the hair, while treating the Conduct Disorder as a moderator. Of course, these are not real-world dialogues, and even if they were, it might not happen that the first does lead to escalation, while the second de-escalates the problem. However, these artificial vignettes do demonstrate how much harder it was to validate the patient, when the diagnosis was understood as the cause of the problem, rather than the soup. They are also consistent with this study of involuntary hospitalisation, (referred to in the table as the “nonexistent fact”) as their tabulated results show. While law requires involuntary admission to be an explicit care topic in many jurisdictions, the pattern of commentary will be familiar to all who work, or have been patients in mental health. We can see how so much invalidation of the patients’ experience has been through the improper understanding of diagnosis as a cause, rather than a moderator of what is happening. As the Nursing Process is used in Brazil (usually without a nursing diagnosis) it also fits with UK observations that, despite claiming a more holistic approach than medical diagnosis, the nursing process carries a risk of reductionism. Organisations have three routes to oppress people: they can create confusion; they can dominate the discourse; and they can invalidate experience. In relation to mental health, we have seen the first of these arise in the opacity and fragmentation of the multidisciplinary team; the second in the deployment of formulations; and the last in misusing diagnosis within the Nursing Process as a causal, rather than a moderating factor in patients’ experiences. It is ironic that all these three are seen as protections from the tyranny of medical diagnosis, rather than contributors to the disempowerment of patients. “One Flew Over the Cuckoo’s Nest” is probably the paradigmatic anti-psychiatry film, and has demonised ECT, possibly forever. However, it’s primarily about the power wielded by psychiatric nurses: doctors are portrayed as ineffectual legitimisers of Nurse Ratched’s regime. In the book, a striking feature is that treatments are provided to control disruptive behaviours, or justified by formulations. The main protagonist, McMurphy, is eventually treated without a diagnosis ever being finalised for him. Diagnosis, properly constructed and appropriately used, acts to protect patients’ rights and freedoms.